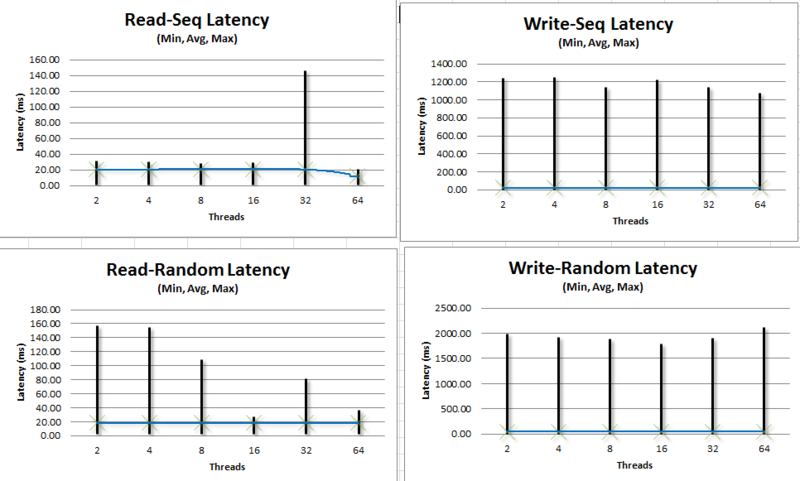 Over the past few evenings, I’ve been playing with SQLIO, to get an idea of how SSD compares to a couple of servers (one quite old, one a bit newer) that I have access too. 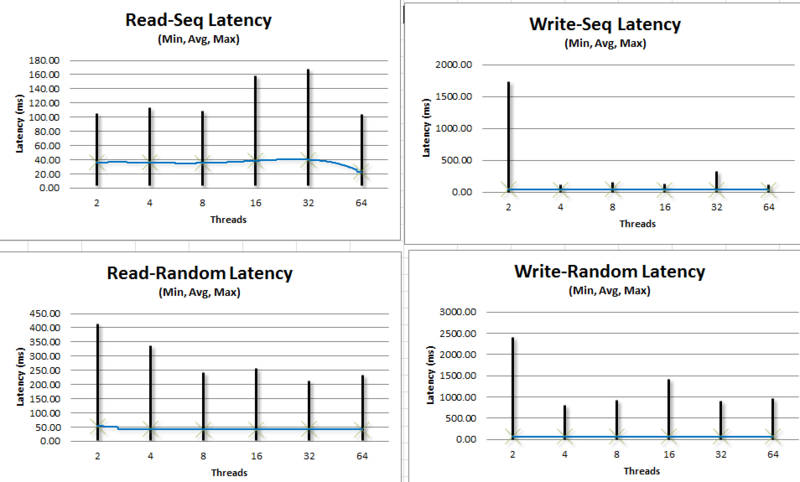 SQLIO can be used to do performance testing of an IO subsystem, prior to deploying SQL Server onto it. It doesn’t actually do anything specifically with SQL, it’s just IO. The SQLIO Analyser, created by David Klee, is amazing. It allows you to run the SQLIO package (a preconfigured one is available on the site) and submit the results. It then generates an Excel file that contains various metrics. It’s nice! Having run the pre-built package on my laptop, I got the following metrics out of it. As you can see, it’s an SSD (Crucial M4 SSD), and pretty nippy. So, running this on an older server, connected to a much older (6-8+ years old) SAN gave me these results. You can see that the metrics are all much lower, and there is a much wider spread of for all the metrics, and that is down to the spinning disks. 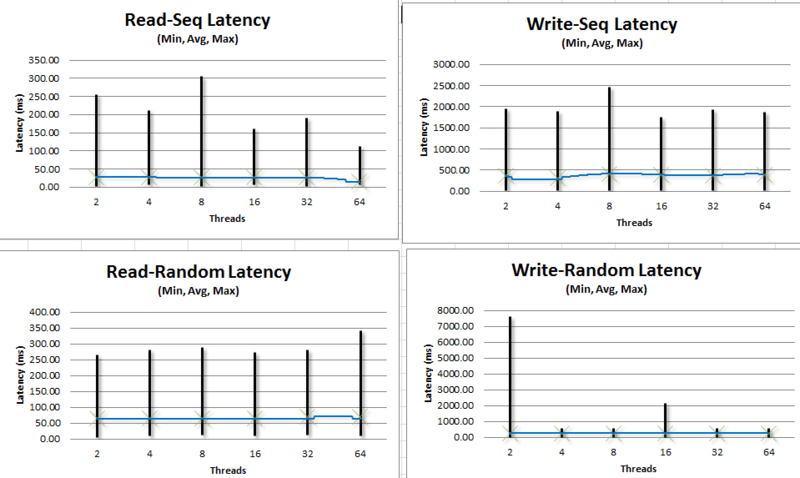 As you can see from the metrics below, there is a significant drop in the performance of the server, a lot more variance across the load types. So, next I had the SQLIO package running on a slightly newer server (with a higher spec I/O system, I was told), which gave the following results. 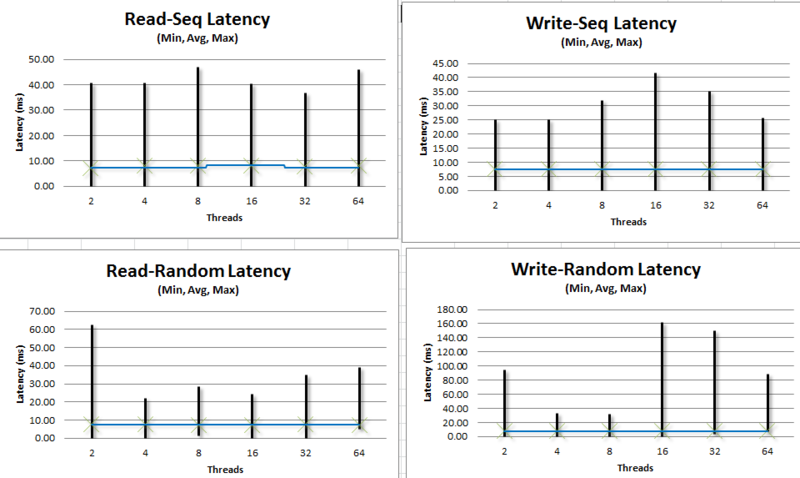 As expected, this did give generally better results, it is interesting that Sequential read had better throughput on the older server. While the whole process was running, Task manager on the host machine was sitting at around 0-2% for disk utilisation, but the CPU was sitting at 50-60%. So, it was hardly touching the disk. Also, take your test results with a grain of salt. Disclaimer : I’m not a Linux Expert, and I’m sure that doing everything as root is bad, just like doing everything as a Domain Admin account is bad. Having seen that the CTP version of the Microsoft SQL Server ODBC Driver for Linux has been released, I thought that it would be an interesting thing to play with. Particularly since it might be something I’ll interact with using C++. Officially, it’s supported on Red Hat Enterprise Linux, but I’ve not got that, and you have to pay for it (not much, but still). Having downloaded Fedora 16,installed it in a VM (VMWare Workstation), and fired it up, I needed to install a number of prerequisites. I also needed to install wget. Type it into Filter box, tick the box against the result and click Apply. Note, that you’ll also need the unixODBC Driver manager, and the current version is 2.3.1. I couldn’t get that working, but 2.3.0 does work, and is available to download here (unixODBC-2.3.0). To get everything to work, I downloaded the files into the Downloads directory, and follow the instructions on the MS Downloads page (copied below, and with an item (3) added by me to make life easier). Make sure that you have root permissions. Type “YES” to proceed with unpacking the files. This part of the process can take up to five minutes to complete. After the script stops running, follow the instructions on the screen to install the unixODBC Driver Manager. After reviewing the license agreement, type “YES” to continue with the installation. As if by magic, I can now query a SQL Server database, from Linux! This was surprisingly straightforward I thought. My next thoughts will be to see if I can communicate with it from code (C++ since it’s Linux ). It’s been requested that I post the odbc.ini and odbcinst.ini files I used. These are shown below, and are unchanged by me. 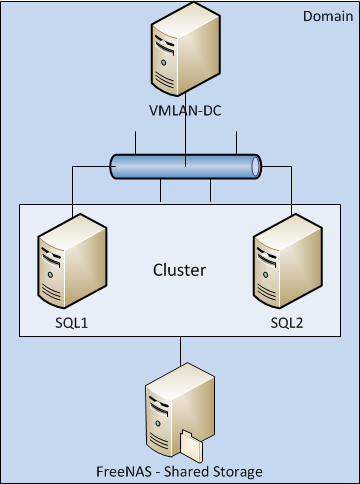 As part of this ongoing series in creating a Virtual Cluster, this post will cover the creation of the Windows Cluster, using the Shared Storage created in Part 1. As can be seen in the proposed architecture diagram to the left, we have a Shared Storage device, and next we’ll be setting up the Windows Servers, then adding the two SQL Server boxes together to create a cluster. 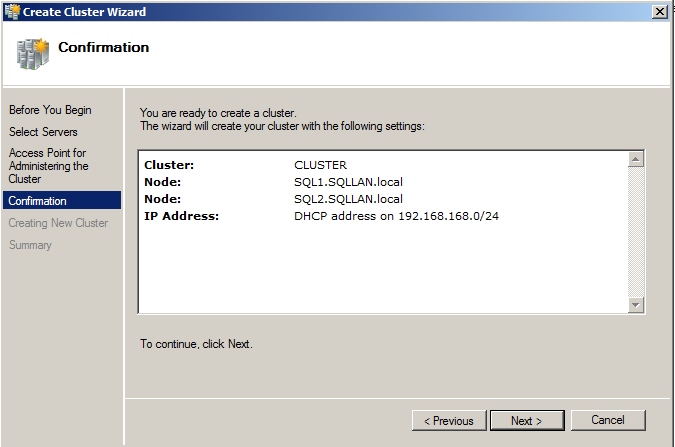 Part 3 of this series will be to create a SQL Server Cluster. I’m going to assume that you can install Windows Server 2008 R2. We’ll be needing three instances of Windows Server 2008 R2. One running as a Domain controller, and two member servers. So, go ahead and create those three VM’s, set one up as a domain controller, and add the two member servers to the domain. Note that each of the Network cards in each server should have static IP Addresses. For the specification of the servers, I’ve gone with this for the domain controller, since it doesn’t require a huge amount of resources. 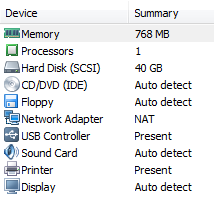 The two member server’s need an additional network card for the heartbeat connection. 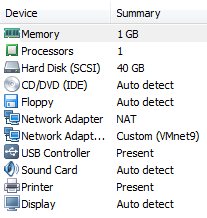 To achieve this, both these server’s have an additional network adapter, configured on a private network. Once the two member servers are up and running, go to Server Manager, right click on Features and Tick the Failover Clustering option. Click through the Wizard to install it. Do this on both Member servers. 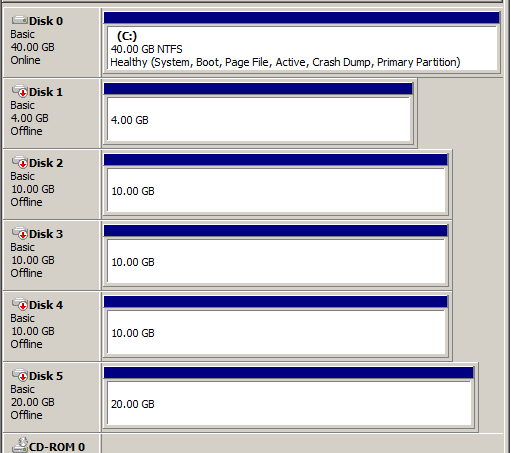 Then, you’ll be able to click on the Targets tab, and you should see the drives hosted on the FreeNAS VM. 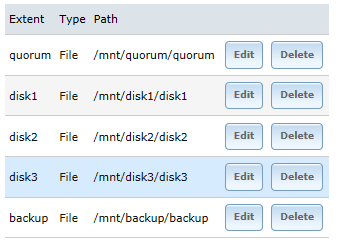 Highlight each disk (starting with the Quorum disk) and click the Log on Button. Tick the ‘Automatically restore this connection when the computer starts’ tickbox, and click Ok. Repeat this step for each disk. Next, you’ll be able to go to Disk Management, and you’ll see the disks you’ve just created. For each disk, you need to Bring them online, Initialise them, Create a Simple Volume on them using NTFS, and then take them offline again. Next, we need to add the iSCSI drives to the 2nd Member Server. 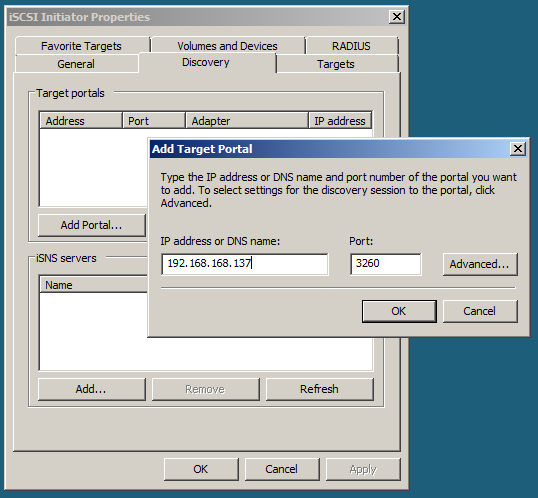 So go to Start -> Administrative Tools and launch iSCSI Initiator. If you are prompted to Start the Service, say yes. As before, go to the Discovery tab, click Add Portal, enter the IP Address of the FreeNAS VM, and click OK.
Go to the Targets tab, and Log on to each of the drives, and ensure you tick the Automatically log on tickbox. 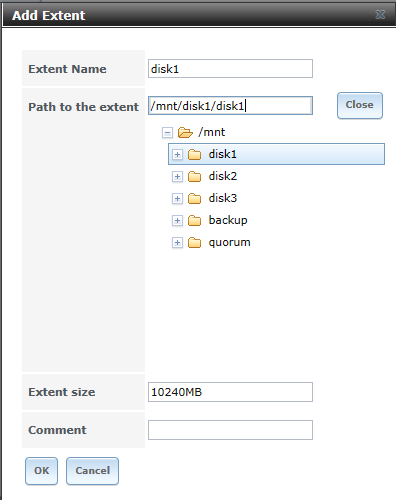 Next, go to Disk Management in Server Manager, and you should see the drives, Offline, and with Blue lines, indicating the drives are configured. 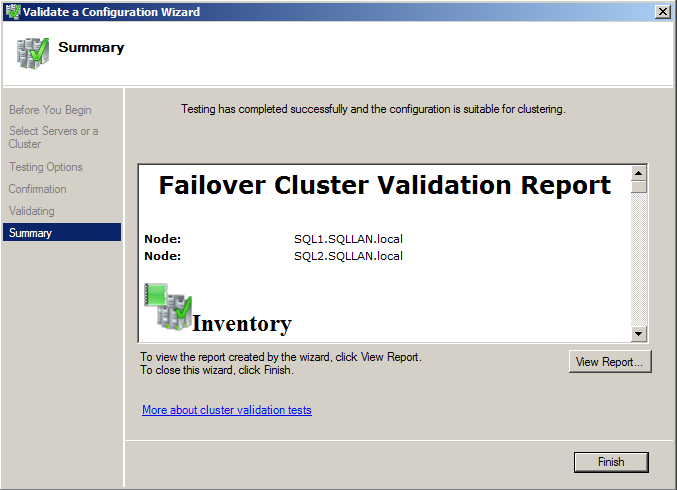 One of the really helpful features of Windows Server 2008 R2 is the ability to validate your cluster configuration, prior to creating it. It runs a whole long list of tests, and tells you how it got on. Tests include the Disk Subsystem (can both members connect to the drives), Networking (is there a Heartbeat card in both, that communicates, IP Address checks, etc) and checking all the services are configured appropriately. 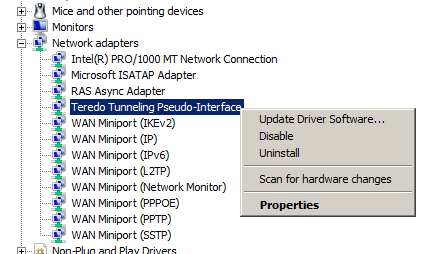 Note: If your validation fails due to an IP Address conflict, and you can’t see a network card that is causing it (since all your servers have Static IP Addresses), there may be an issue with the ‘Teredo Tunneling Pseudo interface’. This can be resolved by going to Device Manager, go to View and click Show Hidden Devices. Right Click on the Teredo Tunneling Pseudo-Interface and choose Disable. Then revalidate your Cluster configuration. Once we’ve successfully Validated the cluster, we can create the cluster. 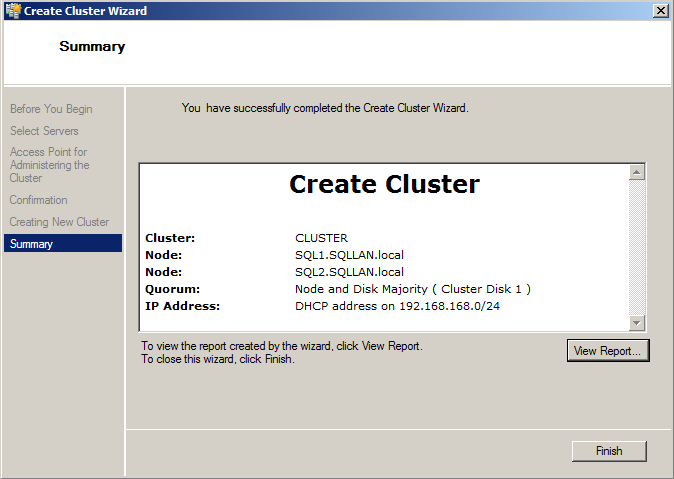 This can be done by Clicking ‘Create a Cluster…’. You’ll be presented with a Wizard. Click Next, and enter the names of the two member servers and click next. Enter the name of the Cluster, and if you have DHCP, the IP address will be configured. If you aren’t using DHCP, it’ll need to be specified. Click next, and the information will be confirmed. Click Next and your Cluster will be created. If everything is successful, you’ll get a confirmation screen, and confirmation of the Quorum type configured. 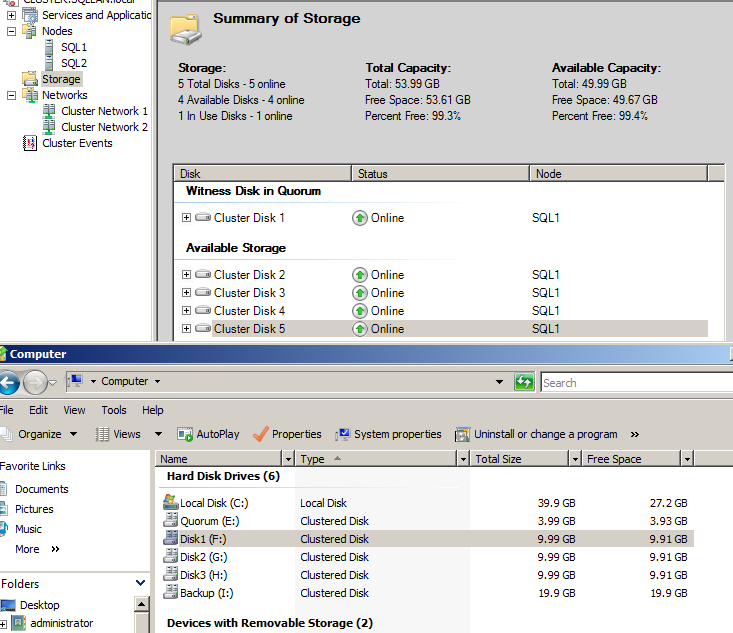 You’ll then be able to see the details in Failover Cluster Management, showing the various disks, and the drives will appear in Windows Explorer, showing the Clustered Disks. 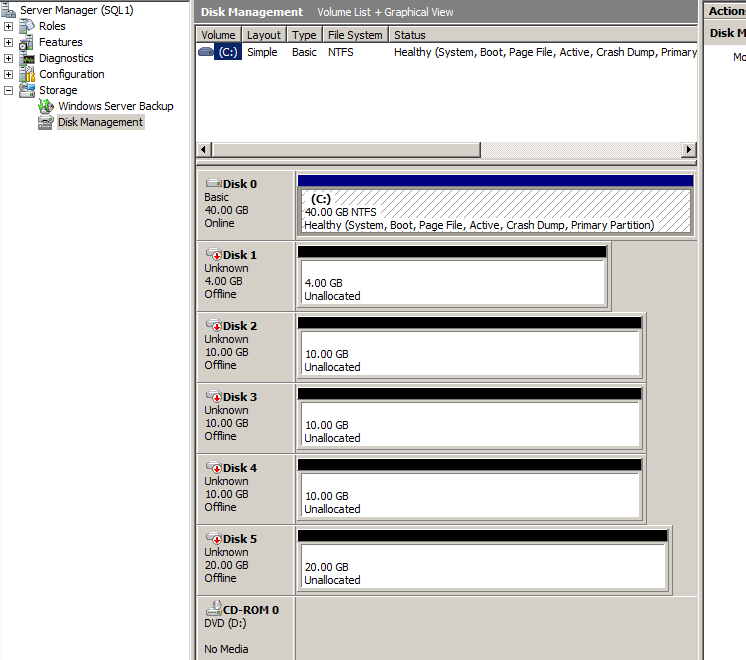 So that’s Part 2 completed, we now have a Shared Storage device, and a Windows Cluster running off it, using 4 VM’s. 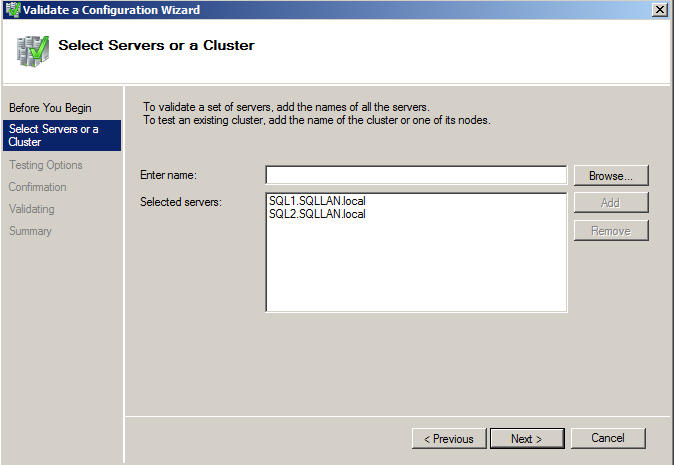 Next we need to install SQL Server on the Cluster to get it doing something. As part of my ongoing work towards the MCM Certification in SQL Server, something I wanted to look into was the creation of a cluster to play with. It turns out this isn’t a straightforward as you might think (!). DISCLAIMER – This isn’t a plan for a live production environment. It is a plan for a set of Virtual Machines, that you can use to play with. DISCLAIMER 2 – This is most certainly not a guide on how to use FreeNAS. This method works, but I make no claims that this is the best way to do it, as I’m certainly not a FreeNAS Expert. I’m anticipating creating a network as shown in the diagram to the right. It’ll be a Windows Domain, so there’ll be a Domain controller (VMLAN-DC), two SQL Server’s which’ll eventually be running in a Cluster. One thing that a Cluster needs is a shared storage area. To achieve this, I’m going to use FreeNAS, which is an Open Source Storage Platform. It’ll allow me to create ISCSI-3 drives and since Requirements for Windows clustering specify Serial attached SCSI, Fibre Channel or ISCSI for storage, that’ll work. 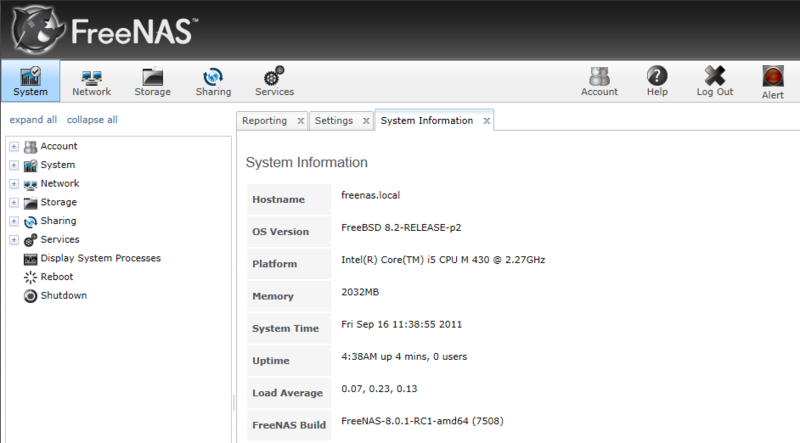 I’m going to use FreeNAS 8 since that is the current (at this date) version. It’s a free download, so go here, and set it downloading (approx. 130mb). 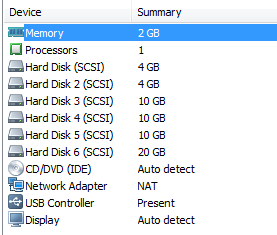 2 Gb RAM, which I may reduce after testing, and just the one core. Hard Disk 1 will be used by FreeNAS. Hard Disk 2 will be the Quorum disk (used for Clustering). 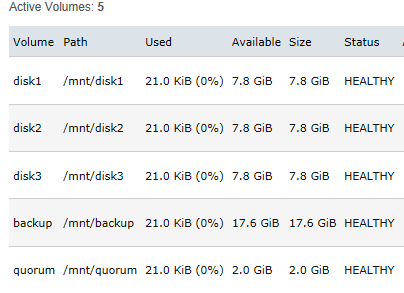 Hard Disks 3-6 will be available for shared storage (Data, Log, Tempdb, Backup). Virtually insert the ISO Image, and start the VM. Choose da0 to install to the appropriate Disk. Click Yes, to continue with the installation. Upon completion, Press OK, Choose 4 to Shutdown the machine, and when it’s done, ‘eject’ the ISO Image. The important bit here is the web address at the bottom. Open that up in a browser. The first thing to do is assign a password, as this’ll get rid of the annoying red light in the top right corner. Click the Account Icon, choose the Change Password option and enter a new password. Next click on the Services icon, and click the spanner next to the iSCSI service. So, click the Portals tab, and click Add Portal. The IP Address of the server should appear in the box, if you have 0.0.0.0, replace it with the IP Address of the server, so it should be <ipaddress>:3260. Then click ok.
Next click, Authorized Initiator, to add an Initiator. Leave the defaults here (ALL and ALL) and click Ok.
Next we need to add extents to the NAS, so click on the Extents tab, and click Add Extent. Again, we need to create one for each disk, so enter a name, choose the path, and add /<diskname> to the end, and specify the extent size, which’ll be 10240MB for the 10gb disks. Repeat this for each disk. Next we need to associate the Targets we created earlier, with the Extents. 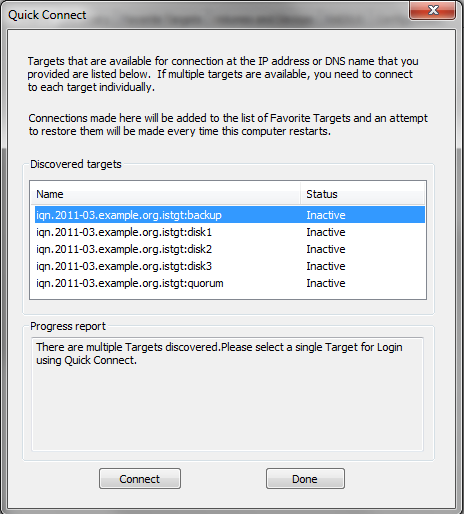 Click on the Associated Targets tab, click Add Extent to Target, and for each disk, pick the Target and Extent to match. Next, click the System Icon, click Reboot, and let the system reboot. When it comes back up, log in to the Web UI again, click the Services icon, and click the On/Off Toggle next to iSCSI and it should start. 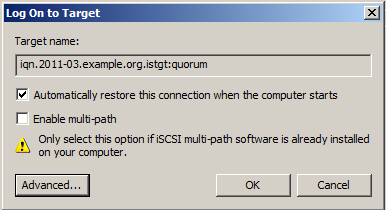 The easiest way to test that the iSCSI connection works is to run the iSCSI Initiator, which’ll be on a server, or your Windows 7 Desktop. 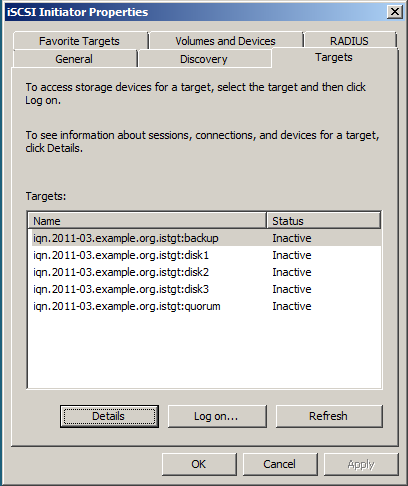 Go to Start -> Administrative tools and click iSCSI Initiator. It’ll ask to start the service. Say yes. 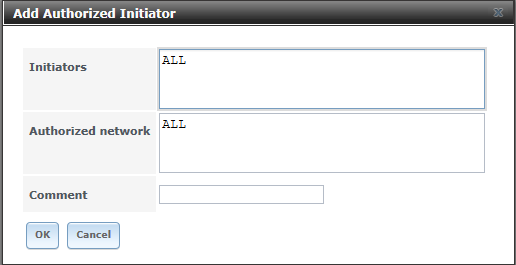 Then, in the Target box at the top, enter the IP Address of your FreeNAS VM, and click Quick Connect. 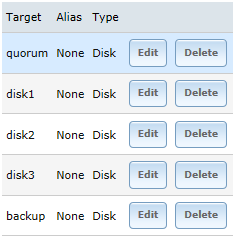 If all is working, you’ll be presented with the list of disks from the FreeNAS VM. Congratulations, you’ve created a FreeNAS Environment for your Cluster!